Samsung, today, has unveiled a possible competitor to the Microsoft Surface and Apple iPad Pro lines. 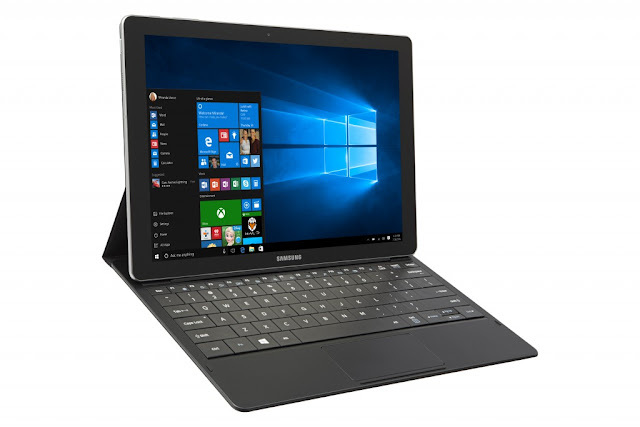 It's the Galaxy TabPro S, which is a Windows 10-powered tablet that can be paired with a keyboard and Bluetooth pen. The new Samsung tablet measures 290.3 mm x 198.8 mm x 6.3 mm and comes with a large 12-inch Super AMOLED display of 2,160 x 1,440 pixel resolution. It is powered by a 6th generation dual-core Intel Core M processor with 4GB RAM. It also has dual 5-MP cameras- one in front and one at the back. The Samsung Galaxy TabPro S is the first Galaxy tablet to ship with Windows 10. It offers full PC functionality, which includes Microsoft Office, OneDrive, Cortana, etc. A 5,200 mAh battery will keep its lights on. It will come in both LTE and Wi-Fi-only variants in black or white color options and will be released this February 2016. Are you getting one?